On Scene: Protect your loved ones in case of a fire, products to give you peace of mind. Protect your loved ones in case of a fire, products to give you peace of mind. Because of the cold winter months, the use of space heaters, chimneys and heaters that haven't been serviced all increase the risk of house fires during this season. We want to make sure you are safe and sound, your family and loved ones being top priority. Here are some products that can give you peace of mind to make sure your safety isn't being compromised. Please, make sure the smoke detectors in your home are all working properly, have fresh batteries, and be sure to test them! This is critical to your safety in the event of an emergency and not to be taken lightly. 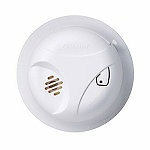 We sell all kinds of Smoke Alarms and Carbon Monoxide Detectors, so browse our options here. Do you or your children sleep on the 2nd or 3rd floor? Do you know your plan of action in the event of emergency? 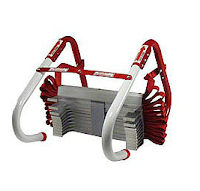 Keeping one or two of these KIDDE Personal Escape Ladders (available in 2-story or 3-story) in a room on the upper floors is the best way to assure you and your family can get out safely. They can hold up to 1,000lbs, so weight is no issue. These will help give you peace of mind and a plan of action. Every home (especially kitchen!) should have a Fire Extinguisher! We have plenty to choose from and it's just a good way to make sure a small kitchen fire doesn't spread to something worse. 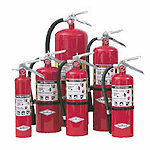 Take safety in your own hands, and shop our Fire Extinguishers here. Make the safety and of you and your loved ones top priority this winter! Shop our Safety Products today.